Mr. Selfridge, which airs on PBS in the US, has wrapped production on its fourth and final season. There will not be a fifth season. News that the series was cancelled was never actually confirmed, but Amanda Abbington said that the fourth season would be the last. Jeremy Piven went to his Twitter on Friday, and he revealed that production had wrapped. His tweet also retweeted a message confirming the end of the series by Abbington. When will the fourth season air on PBS? Cartermatt reported on Monday that fans can expect the final season to premiere on the network in March. Are you sad to hear about the end of Mr. Selfridge? Tell us what you think. 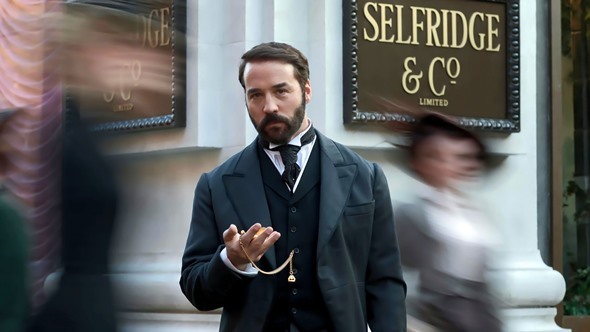 More about: Mr. Selfridge, Mr. Selfridge: canceled or renewed? Im so sad. I miss all the characters. Very sad ending, must be continued!!! Please!!!!!! I loved the whole series. I was not a Piven fan, having heard he was rather spoiled and rude, but I now realize how talented an artist he is. I wish the series had continued. Bravo cast. One of the best series and it’s being cancelled ! Very BAD decision. Will think twice about next PBS donation. PBS is having TOO many different series and ending them prematurely once you get hooked on watching them. Someone at the top is making very bad decisions. I loved the show it was interesting to see the era and especially the fashion. The story line always remained strong and well written and kept you coming back for more as it was always thrilling. Very well acted by all the cast and sorry to see this show end it would have been nice to have a Season 5 – any chance? I loved this series, could not get enough of it. Everything about the show kept me fascinated and waiting for the next episode. I love this era, the culture, the fashion, the class and that it is based on a true story. I will miss watching this show. I so loved watching this series, and hated to see it end. It was much more than just about fashion and makeup and jewelry. The period costumes and historical events were very interesting! ! The interaction between the employees and all the different personalities added to the delightful story of how the Selfridge family made this an enduring business empire. More like this is needed! I have been watching Mr Selfridge on Netflix and I’m trying to stretch out season 4 as I’m just finding out that this is the last season that was made. I can’t believe how much I love this show! I drive my family crazy because it’s all I talk about! I think in another life I was from the 1920’s haha! The clothing, the hair, the progress. But for now I will enjoy Tge show My Selfridge and of course Jeremy Piven! Love him! I wish they would reconsider and do a season five!